When we buy a half pig (which we did last week) we get certain cuts of meat that wouldn’t normally feature on our regular supermarket shopping list but we don’t like to waste them. With a fridge full of pig liver and the excess fat trimmed off the casserole/mince cuts, we needed to consult the recipe books for some ideas. Thankfully the French Brasserie Cookbook: the Heart of French Home Cooking by Daniel Galmiche has a recipe for a Terrine de Porc that I was able to adjust slightly (as is my way) and put all our excesses to good use and even throw in a few homegrown ingredients. I enjoy flipping through any recipe book, but this one is an especially good read with it’s informative wordy bits and easily achievable recipes. Brasserie cooking is probably the best style/type of French cooking to try in the home, as it is not tricky or pretentious, but is wholesome and comforting. This book covers all the basics like stocks, vinaigrettes, mayonnaise, dressings and the various types of pastry. It is illustrated with great photos and as well as finding all the usual French regional delights: Ratatouille, Tarte Tatin (although I did like the twist of rosemary and almonds), Clafoutis, Crêpes, Bouillabaisse, Cassoulet and Beef Bourguignon, there are also some more unusual recipes; Lime Risotto, Vegetable and Chickpea couscous and one of our favourites, a delicious wild garlic soup. 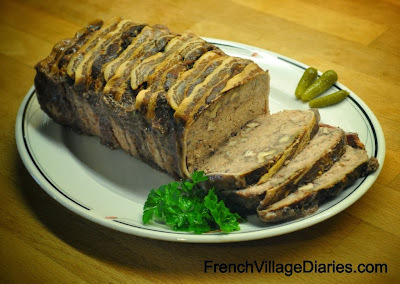 Here is my slightly adapted version of the Terrine de Porc recipe. 600g pork shoulder/neck, coarsely minced (note a true terrine would have some meat left cubed, but we prefer a smoother texture). Mince all the meat, liver and fat, combine with the Cognac, wine, nutmeg, salt and pepper and mix, then cover with cling film and leave to marinate in the fridge overnight. Pre-heat the oven to Gas mark 1/130 degrees and remove meat from fridge. 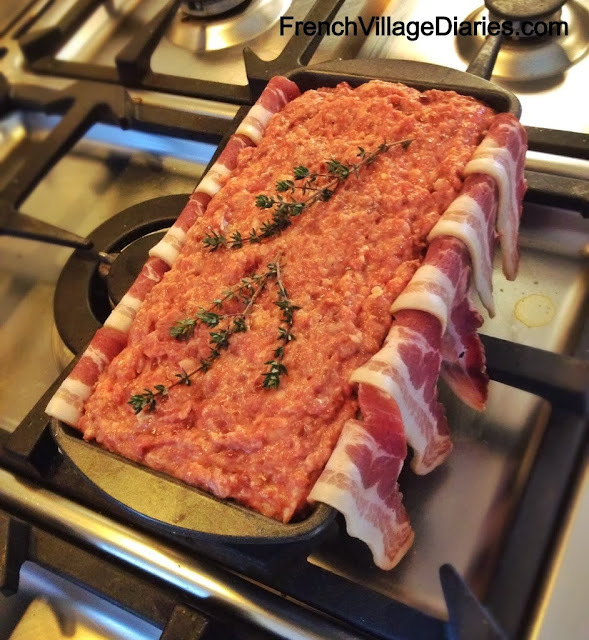 Cover the base and sides of a terrine mould with the bacon, allowing it to hang over the sides. Whisk eggs and cream together and gradually add to meat mix, then add the walnuts. Pack the mix into the mould and push down firmly with a spatula. Place the thyme sprigs on top and cover with the bacon. Place in a deep oven dish and fill dish with hot water to reach two-thirds of the way up the terrine mould. Bake for about 2 hours. It is done when a thermometer inserted into the centre reaches 68 degrees. Leave to cool completely at room temperature with a 1-2kg weight on top. Place a sheet of greaseproof paper between the terrine and the weight. Once cold, cover and place in the fridge for two days to allow the flavours to develop. We always serve on bread or toast with cornichons. French Brasserie Cookbook: the Heart of French Home Cooking by Daniel Galmiche is published by Duncan Baird Publishers and available in hardback and ebook formats.